Continue reading for a brief history and details about what’s in store for the 2019 National Cherry Blossom Festival. As an annual celebration, the Cherry Blossom Festival began from humble beginnings. Small ceremonies took place to commemorate the gift of 3,000 cherry trees from Mayor Yukio Ozaki of Tokyo to the city of Washington, DC. The first ceremony, which took place on March 27, 1912, was simply the planting of the first two trees from Japan by then First Lady Helen Herron Taft and Viscountess Chinda, the wife of the Japanese ambassador. Each year since, the United States and Japan have exchanged gifts, including flowering dogwood trees from the US to the people of Japan in 1915. Every year since First Lady Taft’s involvement, it has been a tradition for the First Lady to be involved in the annual Cherry Blossom Festival. All First Ladies have been proponents of the festival, serving as honorary chairs, taking part in planting ceremonies and greeting guests at opening ceremonies. 1927: DC school children re-enacted the initial planting and other activities, holding the first real festival. 1935: DC civic groups helped to expand the festivities. 1994: The Cherry Blossom Festival expanded to a two week event to accommodate the ever changing blooming schedule of the cherry trees. 2012: The 100th year anniversary of the original gift from Japan was celebrated with a 5 week celebration. Today, the Cherry Blossom Festival encompasses four weekends and draws more than 1.5 million people. Jefferson Memorial: Just across the Tidal Basin, the Jefferson Memorial provides an ideal vantage point to view and photograph the beautiful flowers. Martin Luther King, Jr. Memorial: Surrounded by some of the newest cherry blossom trees that were planted in 2011, this striking monument is not only a sight you shouldn’t miss while in DC, it’s perfect for capturing the gorgeous pink blossoms. Japanese Lantern: An iconic lantern that was carved to honor the Third Shogun of the Tokugawa period, the Japanese Lantern is lit each year by the Cherry Blossom Princess who represents the Embassy of Japan. The lantern is a twin of the Tokyo Temple’s lantern. This is a perfect spot to photograph the blossoms and this unique site. Tidal Basin Paddle-boats: The perfect way to enjoy the Tidal Basin and the magnificent cherry trees! Rent a two or four person paddle-boat and pedal out for panoramic views and awesome pictures. The annual Cherry Blossom Festival takes place every year throughout the city of Washington DC. A celebration of the gift of the cherry trees and our country’s friendship with Japan, the festival features hundreds of events and activities that span two weeks and includes parades, concerts, art and much more. 2019 Dates: This year’s festival will take place from March 20 to April 14. This year’s kick-off to the Cherry Blossom Festival will take place at the Warner Theatre where world-famous performers will entertain guests. Tickets are free, but required to attend. One of the festival’s most popular events, the Kite Festival celebrates spring and 50 years of kite flying on the National Mall and is held on the grounds of the Washington Monument. It’s a great opportunity to witness the wonder and creativity of kite makers and the skill of fliers from all over the United States and other countries. There are demonstrations, contests and more. Guests are invited to bring their own kites and kids can make a kite at one of the activity stations. Throughout the three-week festival, daily concerts will be held at the Ana Performance Stage. A longstanding tradition, the National Cherry Blossom Festival Parade is a colorful, energetic and elaborate event that people of all ages look forward to each year. This year’s parade will take place on April 13 from 10am-12pm. Helium balloons, marching bands, celebrity entertainers and performers will delight the crowds for 10 blocks along Constitution Avenue from the National Mall to the Washington Monument. Grandstand seats are $20 and viewing from Constitution Avenue between 9th and 15th Streets is free. Get there early to get the best view! When: April 13, 2019 from 10am – Noon. Held at The Wharf and formerly known as Southwest Waterfront Fireworks Festival, this signature event includes stunning, interactive art installations, games and activities, live music on three different stages and of course, a fantastic fireworks show display. This event is open to the public and free to attend. This annual festival fundraiser marks the end to the winter season and a welcome to Spring in Washington D.C. Proceeds benefit the National Cherry Blossom Festival, inc. a non-profit dedicated to promoting the beauty of nature and international friendships through a variety of mediums. Attendees can expect superb food from the city’s top culinary chefs, open bar, unique entertainment, live music and an auction. Additionally, this event will bring together over 800 influencers from all over, making it the most buzz-worthy event of the season! Tickets available for purchase. 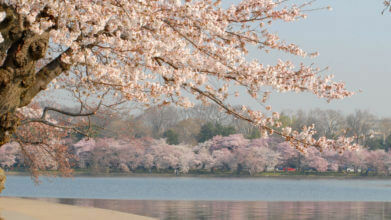 There is so much to see, do and participate in during the annual Cherry Blossom Festival. It’s a good idea to take advantage of the convenience of the Old Town Trolley. While on the trolley tour, you’ll be transported all over the city, including most of the spots where the festivities will be taking place. And because you can get off and on as often as you wish, you can relax and enjoy the events and simply catch the next trolley that comes along. The trolley tour also eliminates the need for driving around the city and trying to find parking. Book your tour in advance to secure a seat during this busy time of year. The annual Cherry Blossom Festival brings joy and excitement to the city unlike any other event all year. For those visiting during this time period, there are many activities, parties and events to enjoy. For more information about the festival, including dates, times and ticket information, visit the National Cherry Blossom Festival’s website.